Investors needed a slew of upbeat news to recognize that airlines are not doomed. Airline stocks flew higher on Tuesday, led by the three legacy carriers. American Airlines (NASDAQ:AAL) stock soared 11.2%, United Continental (NASDAQ:UAL) shares jumped 8.8%, and Delta Air Lines (NYSE:DAL) stock rose "only" 5.5%. There were three immediate catalysts behind airlines' big day. However, at a high level, what really happened on Tuesday was that investors finally realized that their recent panic regarding airline stocks had been overdone. 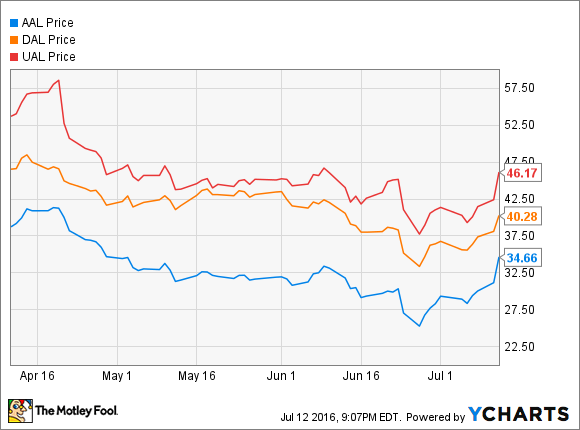 Indeed, even after the big gains on Tuesday, shares of American Airlines, Delta Air Lines, and United Continental are still down by double digits during the past three months. Airline Stock Performance, data by YCharts. The first catalyst for airline stocks was an investor update released by United Continental late on Monday. Back in April, the company had projected that its passenger revenue per available seat mile (PRASM) would fall 6.5%-8.5% in Q2. This implied that United's PRASM trajectory might take a turn for the worse, relative to its 7.4% decline in Q1. In June, United updated its guidance, estimating that PRASM would decrease 6.5%-7.5% in Q2. Monday's investor update narrowed that guidance range, again. United now expects PRASM to decline 6.5%-6.75% in Q2. That's still a significant drop, but it's the best investors could have hoped for based on United's original guidance. Furthermore, the updated guidance implies that PRASM improved sequentially, after all. That helped give investors more confidence that airlines will start to stem their unit-revenue declines in the second half of the year. A second catalyst was American Airlines' announcement that it had extended its co-branded credit card agreements with Citigroup and Barclays. The updated agreements incorporate significant compensation improvements for American Airlines. American Airlines signed a lucrative extension to its credit-card agreements. Image source: American Airlines. In fact, American estimated that its pre-tax income will rise by $200 million in the second half of 2016, by $550 million in 2017, and by a whopping $800 million in 2018, relative to what it would have earned under the prior credit-card agreements. This incremental revenue will improve American's profit margin by roughly 2 percentage points by 2018. That's a big reason why American Airlines stock posted the biggest gain on Tuesday. Finally, analyst Michael Linenberg of Deutsche Bank upgraded shares of American Airlines, Delta Air Lines, and United Continental to buy ratings on Tuesday morning. Linenberg noted that slowing capacity growth and the stabilization of the dollar against most other currencies should drive better unit-revenue performance for the legacy carriers. Linenberg also observed that all three legacy-carrier stocks have been trading at rock-bottom valuations recently. He reasoned that this left little downside for investors, whereas signs of unit-revenue improvement could spark a quick rally in airline stocks. Thus, airline stocks got a bunch of good news recently, catalyzing Tuesday's rally. But there were no huge surprises. For example, American, Delta, and United have all been telling investors for months that unit-revenue trends would start to improve soon -- it just hadn't happened up until now. Similarly, American Airlines executives told investors months ago that the company would, at some point, reap a big financial windfall by signing a new credit-card agreement. And of course, the low valuations across all airline stocks have been plain to see. In short, airline stocks have been dragged down by gloomy sentiment this year. This week, investors got a reminder that airlines' earnings won't necessarily crash at the first sign of economic weakness. However, for airline stocks to fully recover, American, Delta, and United will need to show much-more progress toward their ultimate goal of returning to unit-revenue growth.